The film will screen at Vancouver’s Rio theatre on April 6th at 6:30 p.m. 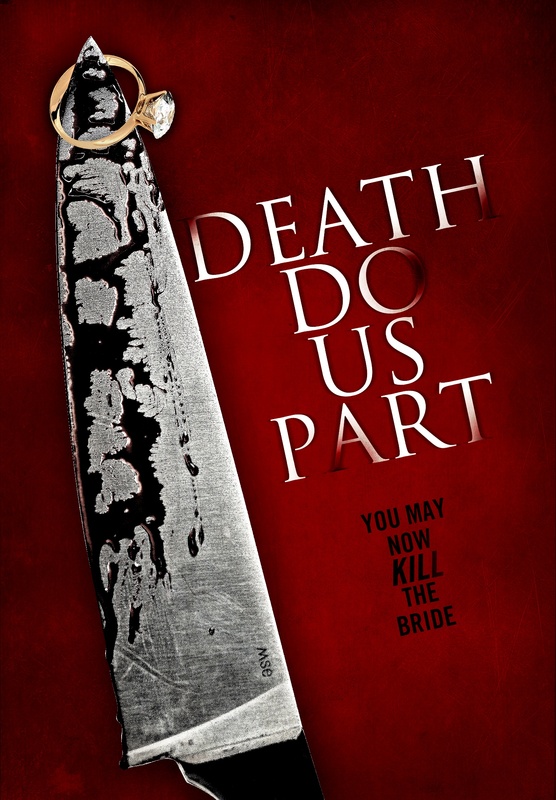 The married duo of Peter and Julia Benson are pleased to announce the release of their horror feature film ‘Death Do Us Part’ on DVD in the United States and Canada on April 15th, 2014. Along with starring in the film, Julia and Peter also wrote and produced ‘Death Do Us Part’ with Ryan Copple. Anchor Bay Entertainment is distributing the film in the U.S. and Raven Banner Entertainment is handling the Canadian release. The film will also play at the Rio theatre on April 6th at 6:30 pm. Tickets are $10 at the door and $8 in advance. ‘Death Do Us Part’ is a horror feature film that tells the story of six friends who go to a remote cabin in the woods to celebrate a ‘Jack and Jill’ bachelor party. Things take a horrifying turn when members of the group are brutally picked off one by one. What starts out as a celebration, quickly descends into a bloody nightmare. Friendships are ripped apart and accusations fly in this blood filled psychological horror with a whodunit twist. The film was nominated for three Leo awards and stars Julia Benson (Stargate Universe, That Burning Feeling), Peter Benson (What an Idiot, Leap 4 Your Life), Emilie Ullerup (Sanctuary, Arctic Air), Christine Chatelain (Sanctuary, Fringe), Kyle Cassie (Lost Boys: The Tribe, True Justice), Benjamin Ayres (Saving Hope, Less Than Kind), Dave Collette (Leap 4 Your Life, What an Idiot), Viv Leacock (Almost Human, Continuum) and Aaron Douglas (The Killing, Battlestar Galactica). Nicholas Humphries (The Little Mermaid) directed the feature film. Peter and Julia are two well-known Canadian actors who are rapidly establishing themselves as a successful writing/producing/directing team with their company Married to the Boss Productions. Six years ago the married couple realized that they wanted more out of their careers and developed a passion for creating their own work. Their first project was a series that they co-created called ‘Kits’ which was accepted into the prestigious NSI Totally Television program. The script that Peter wrote garnered them a development deal with City TV and they served as Executive Producers on the project when a pilot episode was ordered. Julia is best known for her Leo Award winning role as Vanessa James on ‘Stargate Universe’. Julia’s recent credits include MOWs ‘Nobody’s Fool,’ ‘Secret Liaison’, ’Chupacabra Vs. The Alamo’ and feature films ‘That Burning Feeling’ with Tyler Labine and ‘Kid Cannabis’ which is being released across North America on April 18th. Peter’s recent credits include feature films ‘Black Fly’, ‘Afterparty’, ‘Hasting Street’, ‘The Wingman’, ‘Leap 4 Your Life’, MOWs ‘Nobody’s Fool’, ‘Baby Bootcamp’, ‘Mystery Cruise’, and television series ‘Motive’, ‘Supernatural’, and Continuum’. Up next, Julia and Peter are in post-production on their second feature film; a romantic comedy entitled ‘What an Idiot’. Peter wrote and directed the film and Julia produced it with the support of Telefilm Canada. Peter and Julia star in ‘What an Idiot’ along with Lochlyn Munro (Scary Movie) and Kerr Smith (Dawson’s Creek). This entry was posted in Death Do Us Part and tagged Aaron Douglas, Almost Human, Anchor Bay Entertainment, Arctic Air, Battlestar Galactica, Benjamin Ayres, Canadian, Christine Chatelain, City TV, comedy, Continuum, Dave Collette, Death Do Us Part, director, DVD, Emilie Ullerup, entertainment, film, Fringe, horror, Julia Benson, Kyle Cassie, Leap 4 Your Life, Leo Award, Lesley Diana, Less Than Kind, Lost Boys, Nicholas Humphries, Peter Benson, PR, press, producer, publicity, Raven Banner, Rio theatre, romance, Sanctuary, Saving Hope, Stargate Universe, television, That Burning Feeling, The Killing, The Little Mermaid, The Promotion People, The Tribe, True Justice, Vancouver, Viv Leacock, What an Idiot on March 29, 2014 by press.